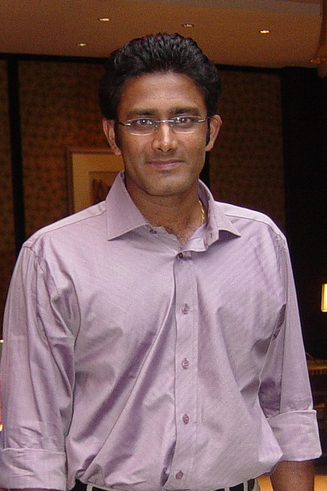 Anil Kumble is an Indian cricketer and right arm leg spin bowler. He is famous for his innings in 1999 against Pakistan. He took 10 wickets in an innings of the test match. He was the captain of Indian cricket team for sometime. He is also famous for his flipper. Anil Kumble was born on 17 October 1970 in Bangalore, India. His parents are K N Krishna Swamy and Saroja. He also has a brother Dinesh. Kumble is married to Chethana Ramatheertha. He married Chethana after her divorce. He has a son Mayas and two daughters Svasti and Aaruni (from Chethana's previous marriage). He studied from Holy Saint English School and National High School, Basavanagudi, Bangalore. Kumble completed his graduation from Rashtreeya Vidyalaya College of Engineering (RVCE) in Mechanical Engineering. Kumble was interested in the cricket from his childhood and he joined Young Cricketers club at an age of 13. Kumble played his first domestic match against Hyderabad in 1989 at an age of 19. He was the player of Karnataka team. Anil Kumble started his carrier as a fast bowler. Kumble made his debut in the ODI’s on 25 April 1990 against Sri Lanka at Sharjah. His test debut occurred in the same year against England. Kumble had the record as an Indian who took first 50 test wickets in only 10 matches before Ashwin broke the record(took 50 wicket in 9 matches). At Eden gardens against West Indies in 1993 Kumble took 6 wickets for only 12 runs. It is an Indian record. He is the only bowler who has taken 10 wickets in a innings after Jim Laker of England. This performance is regarded as the second best "Bowling performance of all time" by wisden. Kumble is the second Indian after Kapil Dev who took 400 test wickets. He is also the highest wicket taking Indian bowler. He has world record in caught and bowled dismissals. He is the only Indian bowler who has taken 5 wickets in a test innings more than 30 times. On 8 November 2007, he was made captain of Indian test team. Kumble is in the 3rd position after Muttiah Muralitharan and Shane Warne to take 600 Test wickets. Anil Kumble took his retirement from cricket on 2 November 2008 at Feroz Shah Kotla cricket stadium at New Delhi, India. Kumble has won many awards. Arjuna award in 1995, Padma Shri in 2005. He was appointed as the chairman of ICC cricket committee in 2012.